On the weekend it's always fun to window shop around town and see what's out there. I'm usually drawn to the home decor stuff that I have no place for. :) Marshall's and TJ Maxx are a couple of my favorite places to browse, SO much cute stuff and at really reasonable prices. Here's some of my faves. Living room set at Homemaker's. 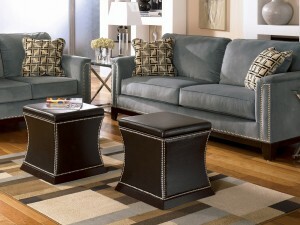 Loving the nailhead trim and the leather ottomans as a coffee table.